I’ve put together a list for my students of what came up on paper 1 and what hasn’t appeared so far. Health warning: mine are target 6 students, so there are some topics missed out, and I have done this having left the paper at school, so I may have forgotten something! However, as always, if you find it useful, use and adapt as you wish. 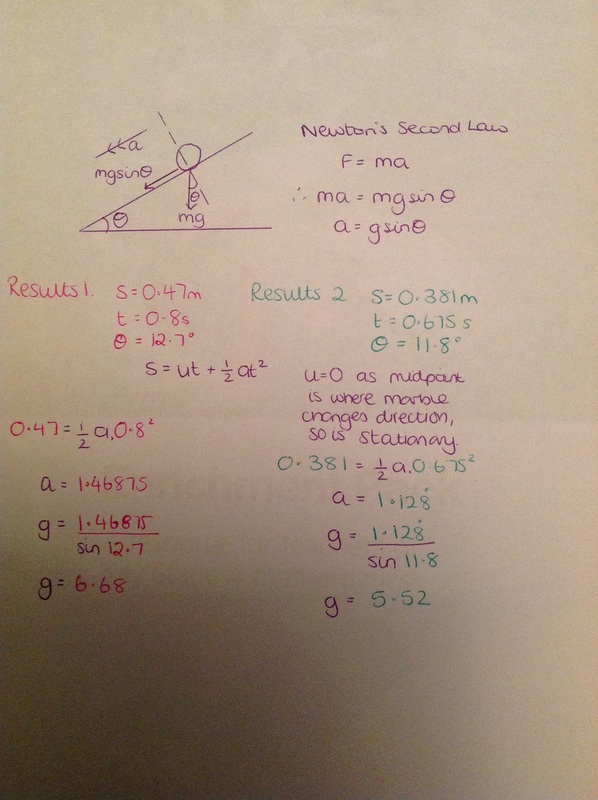 Questions all taken from edexcel past papers, and using new spec questions as much as possible. This warm up powerpoint is aimed at students targeting a grade 6. It’s a mixture of reminders and questions – it’s possibly got too much in, but as I was writing it I just kept thinking of something else I hoped they remembered! Feel free to use or adapt as you wish! In September 2015 I inherited a foundation year 11 class. The class had previously had low achievement levels and included a few pupils (at least 50% if I remember correctly) with SEN. We struggled during the first half term, particularly with getting maths notes and examples written in books. I was printing out an awful lot of write on worksheets and gluing them into books. 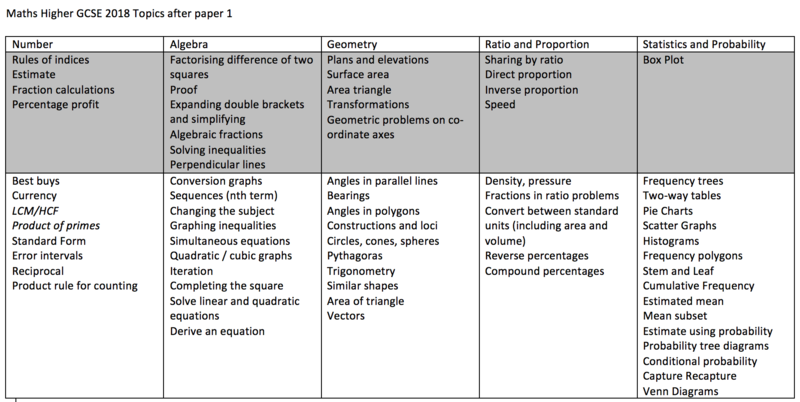 I then read @mathsjem’s post on resourceaholic.com about her foundation group in which she wrote about the folders she used to organise their work and study packs for each lesson. See her updates on this here and here. I thought this would be an ideal way of working with my year 11 group, particularly in supporting their note taking, so many thanks to Jo for introducing me to this plan. The ring binders were such a fab idea, and it just so happened that at the very point I was thinking about this, a friends workplace were closing down and skipping a load of lever arch ringbinders, which she kindly collected for me. Perfect! Two years on, and it appeared so successful after the first year, that I repeated it last year with a similar year 11 group. I’ve added a page with the folder sheets I have used over the last couple of years. I’ll admit I’m quite anxious about putting them all on as I know I’ve used resources that others have kindly shared. I’ve gone through and deleted resources that are from subscription or prominent sites. I’ve linked to TES resources I’ve used from there, but I’m still worried I’ve missed something that someone else took their time to create, so please accept apologies in advance and let me know if I need to credit you. The first benefit of the folders is the organisation of the students work. We had 5 sections: Classwork, Homework, Assessments, Practice Papers and BBQs (more on those later!). It’s great to sling the assessments and past papers into after the follow up work. For the classwork, I prepared a page, usually double sided, for each lesson, with the learning question already written on. I also decided to number the sheets with unit and lesson number on! The real bonus of these sheets is that notes can be laid out for better referral back to them, and all the questions are already on there, so no glueing in! They tended to get a pattern of boxes for facts and speech bubbles to annotate examples. 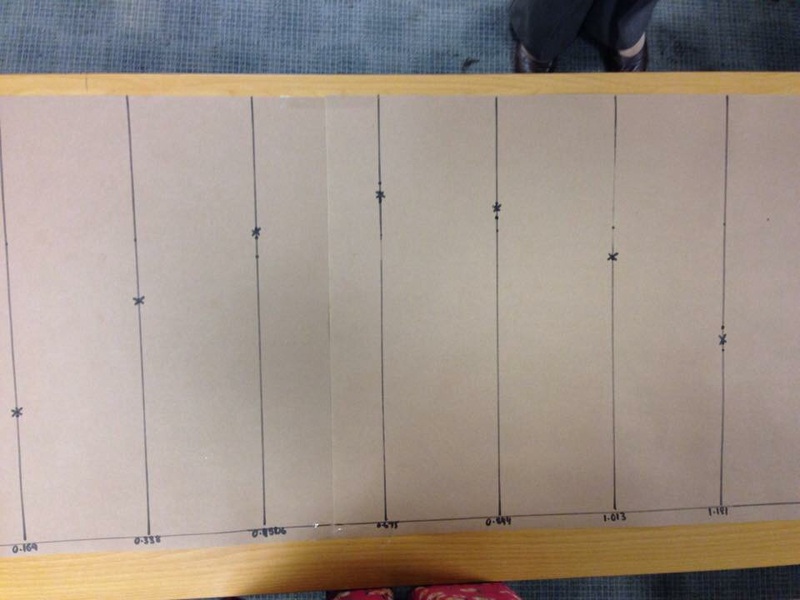 Although it took time to make these sheets, these were the resource for the lesson. I didn’t make a powerpoint to go with them, as I used the visualiser I was lucky to have in my classroom. It wasn’t just a “copy these notes down”; as I was filling them in the same time as the students, it was all about the questioning too. The BBQs are my starters I use. They stand for bread and butter questions; I first used Just Math’s bread and butter questions here, but then I wanted to use certain questions for my group, so developed my own. At the start of the year, I chose a selection of questions and then for four lessons in a row they would do the same set of questions (different numbers!). However, once we started doing papers, whether in class or for homework, I would choose mostly fluency questions which most of the class had got wrong, so the first session has more guided questions and then the next 3 would allow for further practice on these areas. Next job is to upload these! I would totally recommend using folders for GCSE work. I would imagine if I were to do these with a higher foundation group, or a higher group, then I would leave more blank spaces for the students to make their notes, rather than the prescriptive layout I’ve been using with the groups I’ve had. Eeek, I’d been all prepared and printed out resources I had thought to share for speed dating at #mathsconf6, only to leave them on the printer at home. So next best thing I could think of was to get hubbie to take a couple of pics, email them to me and post about them on here. 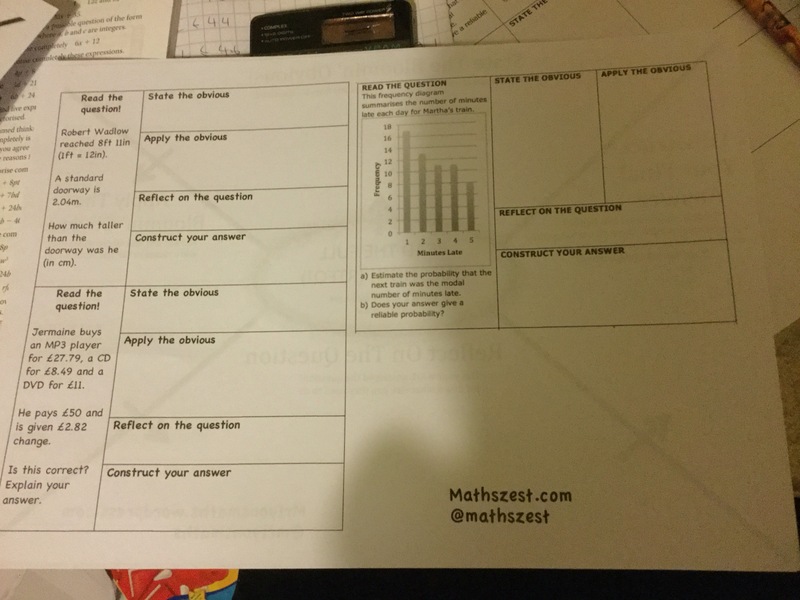 What I was thinking of sharing was a resources from another maths teacher that I had found extremely useful, and had shared with my department, for tackling problem solving, and the difficulties students have sometimes in getting started on a problem. 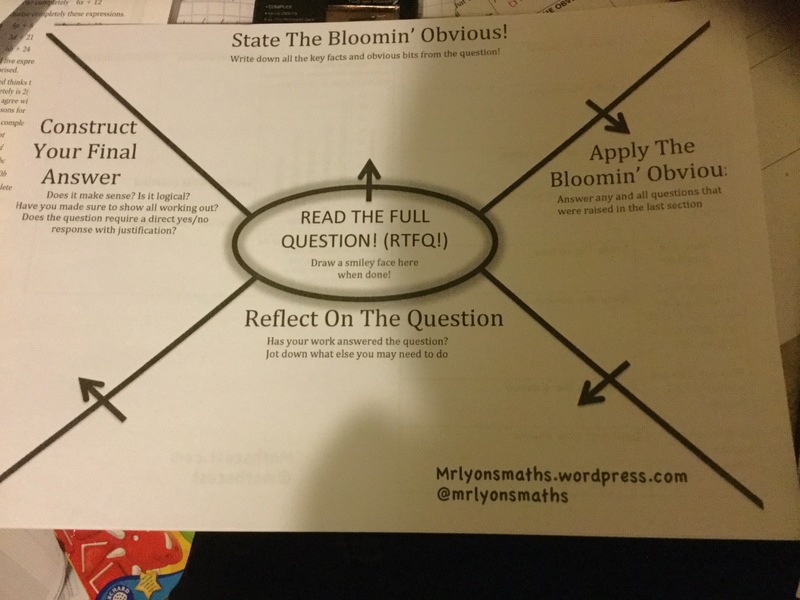 Back in July I read this post from @mrlyonsmaths on his blog mrlyonsmaths.wordpress.com about problem solving and the lack of resilience in even starting at solving a problem. Mr Lyons suggestion was inspiring and I’ve used his resource as a basis for problem solving with my groups this year. This is Mr Lyons’ problem solving scaffold, with descriptors of each section. He’s generously made it available to use it/tweak as required on his blog, following link above. It’s a fab way of getting students started on a problem as to begin with they are rewriting the key points of the question. Highlighting is good when you recognise where you’re going to go next, but for the less confident pupils, thus actually gets them started on writing something, and then some maths just seems to lead on from there. These are just three examples of questions I’ve used the format for, for different year groups and abilities of students. So a big thank you and shout out to @mrlyonsmaths for giving some of my students an entry way into problem solving. In an attempt to get myself blogging more regularly, I decided to join the #MTBoS blogging initiative, so here is my first entry, a day in the life. I thought I’d choose Tuesday of this week, as it was a full day of teaching, followed by parents evening, but as it happens, there was to be a twist in the tale. 7.15: Today my husband was able to take the boys to the childminder, so I can head straight to school, arriving at 7.50. Before school time was devoted to marking my year 10 assessments. There were only 10 of them, so I knew I had time, and was even able to set up the tracking spreadsheet, as well as getting all my resources in order for the day ahead. 8.35: Department briefing, which I came out of with quite a to do list! School starts at 8.50 and I was straight to assembly with my year 9 form. This weeks theme is setting high expectations. 9.10: The teaching starts with yr 12 maths resit group. 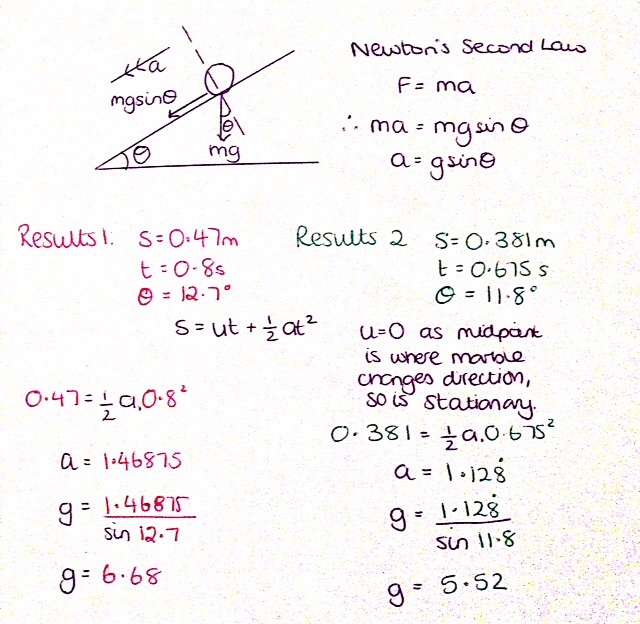 Just had 7 pass their November resit, so the class had shrunk a little, and with mocks going on, there were even less! Started as I always do with a corbettmaths 5aday, then it was working through a past paper as they have their mock at the end of the week. Saw an email that the head had to cancel all her praise appointments with pupils…. 10.10: Guidance with my form. We were looking at Businesses today. A split lesson, so half an hour of Guidance, then half hour break, before the second half hour of Guidance. Had good discussions around a Dragons Den clip, and which offer was the best. Saw an email that there was a full staff briefing at 3.20pm. 11.40: My beautiful top set year 7. A group full of high ability pupils, who love learning. Spent some improvement time on their home learning and previous class work, then it was into learning how to plot a graph from its equation. 12.40: Year 11 GCSE foundation group. These are a hard bunch of kids. Most haven’t got much motivation and very little belief in themselves. They were calculating circumference of a circle, and could do it, but were struggling to settle down and focus just on their work. 13.40: A half hour break for lunch, in which I printed out my data sheets for parents evening, then onto the last lesson. Another year 7 group, set 2 (out of 3). Again, started with some improve my work in their home learning, then was finishing their first algebra topic on formula – writing and substituting into. A lively bunch, who are on the whole quite keen, but chatty too. 15.10: The teaching day finished and time to head for a staff meeting. You may have guessed by now that the head had received the OFSTED phone call in the morning, and they would be arriving the next morning. 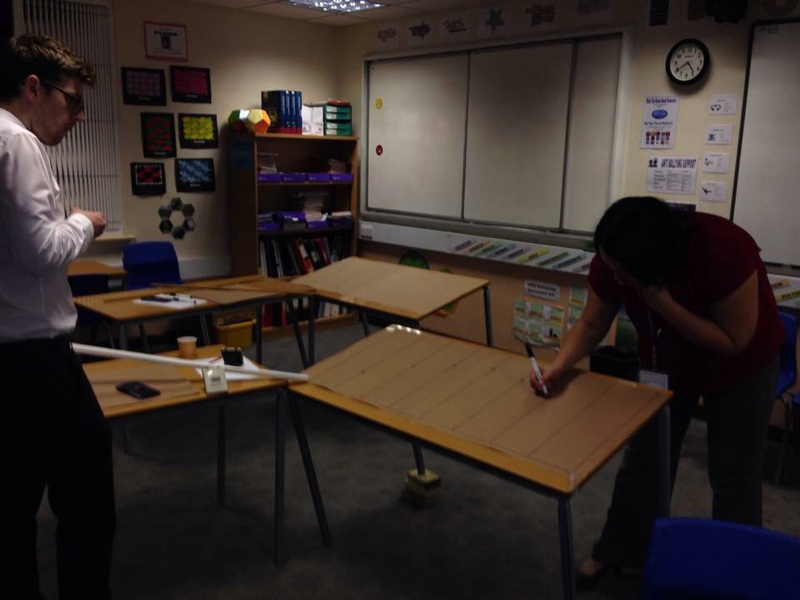 Our school is currently requires improvement and everyone had been working really hard to improve. We knew they’d be coming soon, so not unexpected, but not great timing with most teachers about to head into the hall for 2 1/2 hours to meet with year 8 parents. I make a phone call to my husband to see if there’s any chance he can take the boys to the childminders again in the morning so I can head straight into school. 16.00: Parents evening starts and it’s busy to begin with. Have lots of positive things to say to most parents. It gets a bit quieter towards the end, and although my last 20 minutes weren’t booked, I stay until the end as I really wanted to see those 2 parents who hadn’t turned up earlier, and am just hoping they were late. 18.30: They didn’t turn up, so I head back to my classroom to start preparing for the next day. Most of my lessons are planned, but I had some assessments for yr 11s to file in their folders, which now really need to be in there before tomorrow’s lesson. Those other little tidying jobs on my list couldn’t wait now either. 19.30 I finally leave school, seeing several classroom lights still on as I head for home. It’s not that we want to be different for OFSTED, but know everything must be at the best of what we do, something that would be impossible to do all the time, although it always what we strive for. 21.00: I’ve been home half an hour. Boys were in bed, and my husband has made tea. I’ve had a sit down, refuelled, and it’s back to work. I knew I had my feedback lesson to prepare for year 10s, but with our visitors now coming, I also had to change my planned year 7 lesson from a basic skills fortnightly lesson to a normal curriculum lesson, my seating plans to update and print out in case they were needed, the Teacher Toolkit 5 minute lesson plans to fill in – this wasn’t too hard as I plan in my head using these – and a couple of tweaks to my yr 11 and yr 8 lessons. 00.30: I fall into bed knowing the alarm is going off in little over 5 hours. I wouldn’t normally stay up that late working, but I want to do my best for my school over the next two days. We work extremely hard to do our best for our pupils and I want OFSTED to see that. It’s been a pretty full on term so far, as it always seems to be, so it was lovely to have a break yesterday evening and do some maths for ourselves! We were fortunate enough to welcome Trevor Starbuck to the first Birmingham and Solihull Further Maths Support Programme network meeting hosted at John Willmott School. The intention of these network meetings is to bring together teachers from across the city who have an interest in meeting with other teachers to explore issues relating to the teaching and learning of mathematics and further mathematics at A Level. Trevor had spent part of the afternoon talking with some of the higher achieving Year 11s, and then turned his attention after school to a small but very enthusiastic group of willing maths teachers. Not having had the privilege of teaching A Level, and still holding a passion for all the mechanics modules I chose at Uni oh so many years ago, I was really looking forward to this session. The classroom we were meeting in had been transformed into a den of mechanics experiments. Trevor’s enthusiasm for the subject was radiating from him as he introduced the two experiments we were to undertake. These involved, amongst other things, half pipes, marbles, clamp stands, metre rulers and timers. 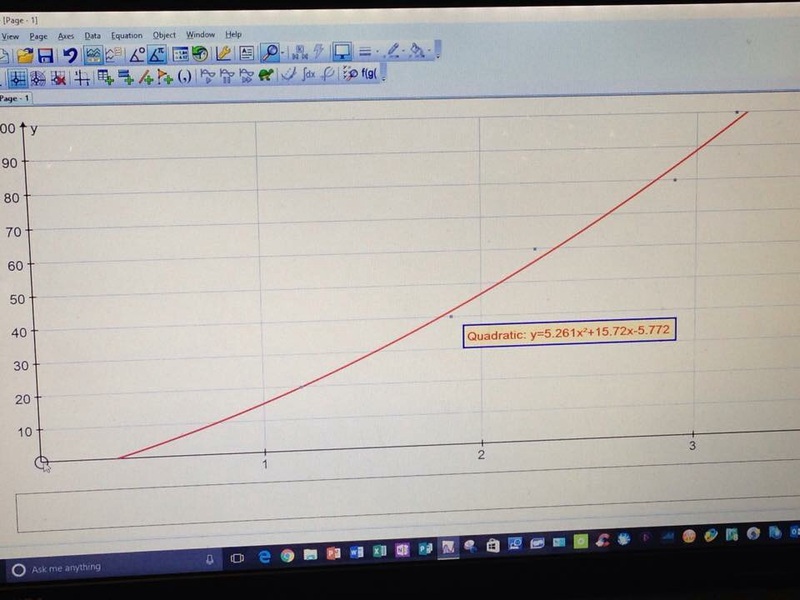 The curve shows a quadratic relationship between the distance and the time. The second experiment involved the the rolling of a marble across a tilted table. 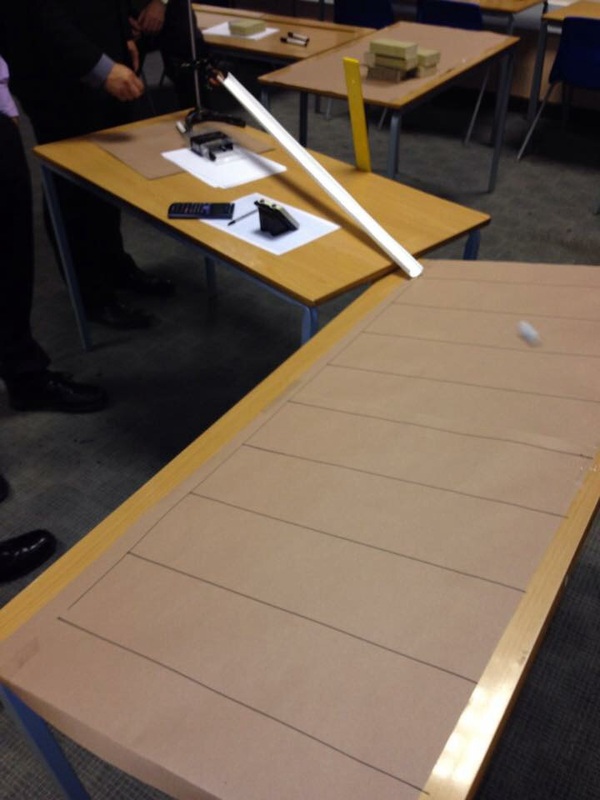 Our job was to track its path as accurately as we could, to gather data on its path, distance and time. We first set the pipe and clamp stand so the marble could travel a decent path up and across the tilted table. Next was to identify the end point of the path, which crated the x-axis. This path was timed (at least 5 times, and a mean value taken) and the axis was then split into 8 equal parts. Rolling the marble as consistently as possible, we tracked when it passed each division (again, 5 times for each, taking the median of the points we had plotted on the division lines). We ended up, as you would expect, with a lovely parabola. The final two measurements to take were the height of the middle division – the point where the marble started its downward journey, and, using a bit of trigonometry, the degree of inclination of the table. These experiments were reminiscent of those undertook by Galileo in the late 16th Century. Ofcourse, he didn’t have electronic timers, so we were quite relieved when Trevor didn’t insist on use using a water hour glass timer, similar to what Galileo would have used. As well as rolling balls across inclined planes and measuring their distance, Galileo also used the Tower of Pisa to give him a vertical height from which to drop objects. He was able to demonstrate that a body dropped from height starts at zero velocity and increases his speed over time (rather than the constant velocity, that was larger the more the body weighed, assumed by those before him). This also involved his discovery that the velocity of a falling body is independent to its weight and the mathematical expression that, the speed of an object increases as the square of the time, hence our quadratic graph from the results of the first experiment. Fast forward 100 years and armed with Newton’s Second Law of Motion, we are now able to form some calcualtions from our data. 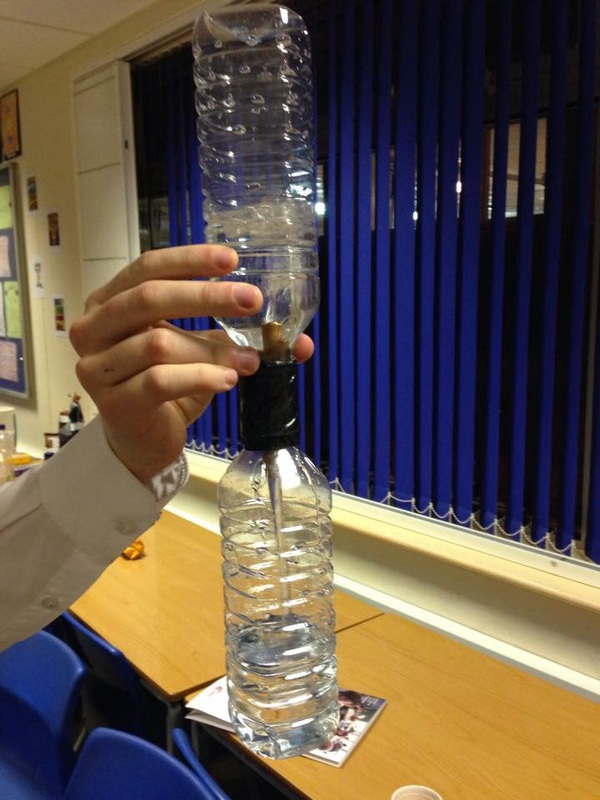 And so we have it; practical experiments and calculation enabling us to derive a (very approximate) value of gravity. There is of course discussion time here for all the aspects not taken into consideration, the main one being air resistence, but our time had come to an end.